It's distressing enough to deal with the symptoms of hay fever, but many people don't realise that the resulting irritation and weakened immune system can also leave them more susceptible to a secondary infection. Inflamed tissues in the ears nose and throat can create a haven for bacterial infections to thrive and the combination of a bacterial infection alongside hay fever can leave you feeling really miserable and overwhelmed with a multitude of painful symptoms. The best way to prevent a bacterial infection that occurs as a complication of hay fever is to prevent hay fever from occurring in the first place. This means adopting a prevention plan, which will likely include strategies such as monitoring the pollen count, avoiding times of the day when the pollen count is high and avoiding any other specific triggers you might have. Immunotherapy based treatments can also help you to handle your hay fever and strengthen your immune system, so that your susceptibility to hay fever is reduced. In turn, this will also help to prevent a secondary infection. Topical and oral medications can alleviate hay fever symptoms by reducing irritation in the eyes, nose and throat, which helps to reduce the chances of a bacterial infection. Ear infections can result from hay fever, especially when symptoms are chronic. The ear canal can become inflamed from swelling that occurs as a symptom of hay fever. The swelling may then interfere with drainage in the ear. If bacterial discharge blocks the ear, infection can occur. Children are particularly susceptible to ear infections, so a child who has hay fever must take extra care to treat the hay fever symptoms to prevent them from becoming chronic. Treatment usually involves antibiotics; once a course of antibiotics has commenced, you can expect relief within a matter of days. Additional complications can arise from ear infections, so it's important that you do see your doctor if you have been suffering from hay fever and find you are also experiencing symptoms of an ear infection. 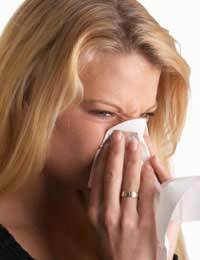 A sinus infection is a bacterial infection in one of the sinuses that drain into the nose. Hay fever can block the sinus, leading to congestion and subsequently, an infection may occur. Sinus congestion often will go away on by itself but if bacteria multiply within the sinus, an infection can occur. Treatment usually involves antibiotics and may also entail antihistamines, decongestants or over-the-counter pain remedies. Sinus infections can be very painful, which means that treating hay fever regularly is vital to reducing inflammation and irritation that can lead to a sinus infection. Complications of hay fever such as bacterial infections can leave you feeling poorly, but medications can help to treat the discomfort associated with the infection. Ideally, you should see your doctor for hay fever treatment because chronic hay fever symptoms will put you at a higher risk for complications. Early treatment not only benefits you by reducing painful hay fever symptoms, but it can also keep bacterial infections at bay. I was diagnosed with asthma years ago and have suffered the hell of hay fever since I was 20 (I am now 50). Along with the traditional symptoms like severe rhinitis; itchy, red eyes; sneezing; sore throat and skin allergies, I also endure repeated ear blockage with fluid and infections. It affects my hearing and there is little that I can do to prevent this. It is difficult to say the least, trying to work and socialize when my ability to hear is quite muffled and many people do not seem to appreciate the frustration or seriousness. I fear that I am becoming a risk for permanent hearing loss. Is this possible?